Standout pitching performances by Ally Wiegand and Brea Walker led the unbeaten and No. 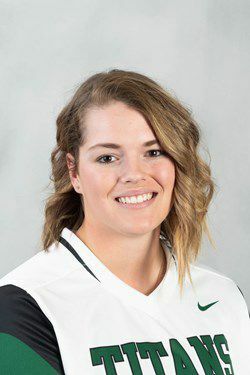 2-ranked Illinois Wesleyan softball team to victories over Thomas More and Linfield on Friday in Kissimmee, Fla.
Wiegand threw a three-hitter as IWU downed Thomas More (Ky.), 2-1. Walker followed with a two-hit shutout of Linfield in a 7-0 victory that improved the Titans to 6-0. Wiegand (3-0) struck out six and walked one while allowing an earned run. Jillian Runyon scored both of the Titans' runs. Colleen Palczynski drove Runyon in with a sacrifice fly in the first before Runyon tripled with one out in the fifth and scored on Hayley Earl's single to break a 1-all tie. Against Linfield (11-2-1), IWU scored all its runs in the sixth inning, highlighted by a solo home run by shortstop Sam Berghoff. Earl, Palczynski, Brittany Murphy and Mia Massaro each contributed two hits to the Titans' 12-hit attack in support of Walker (3-0). Gudaitis lifts baseball: Quinn Gudaitis allowed two runs in six innings to pick up his first victory as Illinois Wesleyan beat Wheaton (Mass. ), 4-2, at Auburndale, Fla. The Titans (7-3) got two hits each from Dom DiLello and Jeran Simpson as Gudaitis (1-0) struck out four. Matt Blaney got the final five outs without allowing a hit to earn his first save. Golfers tied for lead: Drew Persching fired a 3-under-par 69 to pace Illinois Wesleyan as the Titans are tied with LaGrange after the first round of the 30-team Jekyll Island Collegiate Invitational at Jekyll Island, Ga. The Titans and LaGrange each shot an even-par 288 total at Pine Lakes Golf Club. Rob Wuethrich, Andrew Abel and Ben Johnson all had 73s for IWU heading into Saturday's second round. Persching is one off the individual lead held by Mariano Silvestri and Grady Anderson of North Carolina Wesleyan and LaGrange's Sam Rogers. Women's lacrosse falls: Dani Engelbreit had four goals for Illinois Wesleyan as Colorado College beat the Titans, 17-8, in a women's lacrosse match at Colorado Springs, Colo.
Landry Elliott added two goals, while Claudia Richman and Grainne Kelly tallied the others for the Titans (5-2), who trailed 8-4 at halftime. Colorado College (5-0) enjoyed a 41-22 advantage on shots. Men lose in lacrosse: Unbeaten Salisbury (7-0) jumped to a 12-4 halftime lead and cruised past IWU, 22-6, in a men's lacrosse match at Salisbury, Md. The Titans (4-1) received goals from Ty Collins, Patrick Murphy, Will Rossi, Danny Lowe, Jaren Vance and Zack Ladd.